More than 5 feet in length! Naginata is a Japanese martial art form that originated over 1,000 years ago. Due to its massive height, the Naginata was the weapon of choice for battle against horsemen and swords. Stretching over 5 feet tall with a 20" carbon steel blade with intense blood grooves. Challenge your mind, body, and spirit with this martial art classic. Would not recommend, broke after a light swing at the air. Just wanted to get a feel for it and it came apart without making contact with anything. Looks nice so I guess you could put it up for display but even as decoration it isn't very impressive. For the price, $30 normally, $21 with the 30â€° discount I used, this is a great addition to anyone who collects bladed weapons! It's sharp out of the box. Has a very nice appearance. The overall quality surprised me. . The sheath appears to be made of wood. Special shout out to budk for the SUPER FAST delivery time of just over 24 hours without an additional charge.! Thank you Thank you! Great look. Staff is very solid. Connection point between the blade and staff is very shaky. Not a solid connection. Pretty much display only or VERY light use as part of a costume. The pole is too thick to hold properly, and the balance is horrible, cannot even do a proper swing with it. Also the pole looks shorter than it looks. There is also defective workmanship along the rims of the connectors. This thing is awesome i fell in love with it right out of the box. Even though it wasn't sharp out of the box it took a good edge. I have this thing as sharp as a razor blade. the sheath and details are amazing. i mainly keep it as a naginata for that little bit of extra reach this thing is awesome. thanks again budk. Handmade in china. When I saw that I was shocked honestly. 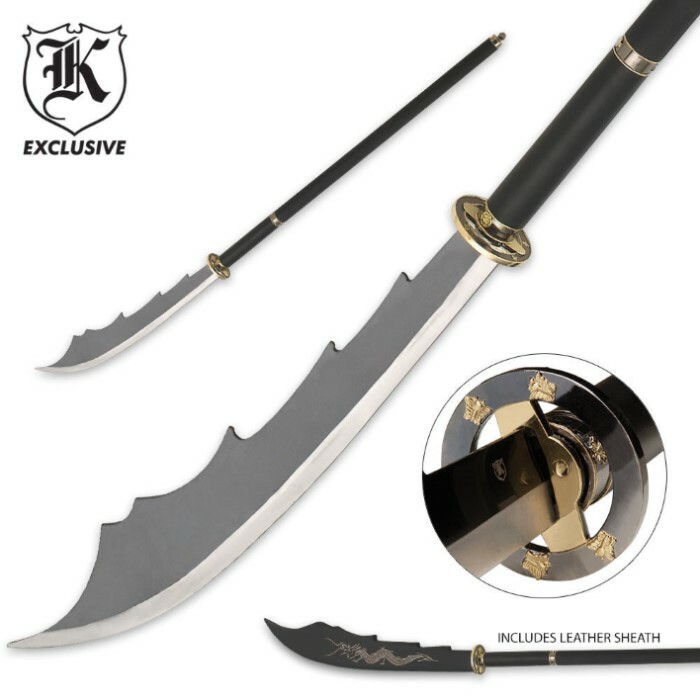 The blade is pretty heavy and hard to swing around if you de-attack the blade from the staff and use it as a sword. great buy, looks amazing on my wall next to a nodachi. It is very nice, glad this site is selling this because their pole arm selection is very small. Was expecting it to be a bit bigger, the blade, but still happy with the weapon as a whole. It is very hard for me to place back the wood protection onto the blade (if sharpened you might cut yourself). It is skinny so you can chop things, but isn't as sharp as I would have liked it to be. Good buy, because it is Carbon steel. The blade is not securely fastened to the shaft and wobbles all over the place. The shaft itself is not well made and chips and dents easily. The bade is fair but has more imperfections than you might be okay with. Interesting piece of gear. Two piece that screws together. Lower handle actually came split a bit from the joint down about 6" from the wood drying out. Still usable though. For actual demonstrations in martial arts, I would be hesitant to swing full force with any snapping motion that may stress the joint. Blade is semi-sharp and can be sharpened to a very sharp edge. Worth the price for a live-blade display and possible low stress demonstrations. My rating takes into account and price for the use.